Just like yesterday. It is exactly fifteen years today when Nigeria returned to democracy. The present democratic dispensation, mid-wifed by ex-Head of State, General Abdulsalam Abubakar, has produced three presidents, starting from President Olusegun Obasanjo (May 29, 1999-May 29, 2007), late President Umar Yar’Adua (May 29, 2007-May 5, 2010) and now President Goodluck Jonathan. While reflecting on the past 15 years of Nigeria’s democracy, our Abuja Correspondent, Justus Awaji spoke with some eminent Nigerians who fought for the enthronement of democracy and their opinions were so candid, vintage, succinct, challenging and thought-provoking! They include the leader of Afenifere, the Yoruba socio-cultural organisation and a chieftain of the opposition party, the All Progressives Congress (APC), Chief Ayo Adebanjo; a member of the ruling Peoples Democratic Party (PDP) Board of Trustees (BoT), Prof Jerry Gana; former Deputy Senate between 1999 and 2007, Senator Ibrahim Mantu, as well as two elder statesmen, Chief Jim Nwobodo who is a Second Republic governor of the old Anambra State and Alhaji Gambo Jimeta, a former Inspector General of Police. Chief Adebanjo, a frontline member of the National Democratic Coalition (NADECO) that fought the vicious Abacha regime, does not recognise May 29 as Democracy Day. As far as he is concerned, ‘Democracy Day’ is ‘June 12’ in commemoration of the June 12, 1993 presidential election, reputed as the freest and fairest election in Nigeria. That election was won by late M.K.O. Abiola. The vocal, fearless and irrepressible political/ socio-cultural activist told The Tide, ‘’I have never been a supporter of Democracy Day on May 29. I am a June 12 advocate. And I believe if there is any Democracy Day, it is June 12. Without June 12, there can’t be democracy… The federal government is still hesitant to acknowledge that. Those of us who fought for it during Abacha era will still remember that Democracy Day is June 12 and not May 29. May 29 is the military democracy day’’. On whether democracy, as practised in Nigeria, conforms with what he and other pro-democracy activists envisaged when they were in their ‘trenches’ fighting for democracy, he was emphatic: ‘’No, we have not had democracy, the way it should be practised. We’ve only had civilian administration because there is a lot of anti-democratic measures being put in place, particularly under ex-President Olusegun Obasanjo, when the government would not obey court orders’’. 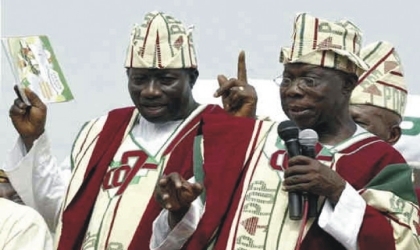 Adebanjo also wrote off democracy as being practised under the incumbent administration of President Goodluck Jonathan, accusing the government of doing things that are contrary to democracy. ‘’There is no doubt that arbitrary things are being done under this government, contrary to what obtains under a purely democratic government’’, he said. On the way forward, Chief Adebanjo said that the way forward lies in the implementation of whatever report the ongoing National Conference will come up with, adding, ‘’I believe that this incumbent administration should do everything to implement the recommendation of the National confab. My own view is the implementation before the (general) elections (next year), he should do the next election on the basis of the recommendations and this nation will move forward’’. Adebanjo said although the national confab may not be perfect, as there are ‘certain procedural inadequacies’ in it, he believes if its recommendations are implemented, it will advance the course of democracy in the country. He wants the National Assembly to give the confab’s recommendations legal teeth, even if it means invoking the ‘doctrine of necessity’ to ensure it is fully implemented in the interest of the nation. But Jerry Gana, a professor of Geography and politician of no mean repute toes a different line from Adebanjo’s, in his assessment. He thumbed up for democracy at 15, giving a verdict of ‘so far, so good’, though there is still room for improvement. ‘’First of all, we thank God for over a decade of democracy. We came back into democracy in 1999 and this is the first major stretch of democracy in Nigeria without interruption; for that, we should thank God! Secondly, it’s very clear that democratic governance has become the order of the day in Nigeria. Nigerians love democracy and what we should do is to make democracy to continue to produce results’’, he said. Gana told The Tide that in the last fifteen years of democracy, ‘’a lot has been achieved.’’ He chronicled the achievements as: restoration of peace and order even though the nation is currently experiencing insecurity, infrastructural development at state and local government levels; as well as restoration of education and health, among others. As the Pro-Chancellor of the University of Lagos who has visited the University of Ibadan, Obafemi Awolowo University, Ife and others, he was emphatic that, ‘’ intervention in the education sector is beginning to bear fruits, such that there is qualitative improvement in terms of the infrastructure. “And of course, it is important for us to emphasize the fact that the major structures of democracy are now in place in Nigeria. We’ve done it in the last fifteen years, it’s very, very good. Over these fifteen years, the executive is in place, the legislature is in place, the judiciary is in place; the electoral system, electoral instruments are in place, civil society is growing, democracy is now ready to move in a very positive way and I think this is good’’. Mantu shares Gana’s views. According to him, the democracy journey is, ‘so far, so good’. His reason: “This is the first time in the history of Nigeria’s political experiment that democracy has been left to last this long”. He recalled that in the First Republic, democracy lasted for just six months; Second Republic, four years and Third Republic, two years, saying, “this time, we are now in the 15th year of fledgling democracy’’. Mantu, however, admitted that the country’s democracy falls below international standard as it is immersed in what he calls “our local democratic principles”, which in his view, is derailing the process. He said: ‘’In the country today, no matter how popular you are, you cannot even become a councillor no matter how vast you are, if you are not in the limelight of the governor of your state. So, governors have taken full control of the party (machinery) in the states. It shouldn’t be so. ‘’Democracy is supposed to be government of the people, by the people, for the people, but when you now allow a few powerful individuals to pocket it, it is no longer the rule of the people, by the people, for the people. But sad enough, this is how we practise democracy in Nigeria’’, he lamented. To Chief Nwobodo and Alhaji Gambo, fifteen years of democracy has not adequately resolved the intricacies associated with power on one hand, and current security challenges on the other. Nwobodo reviewed the power sector while Gambo frowned at the state of the nation, including the alarming rate of insecurity, in spite of democracy. Nwobodo’s verdict: ‘’We have feared very well, considering where we are now, with where we were and where we want to be. To me, it is so far, so good’’. He said the nation may not have arrived yet, but there is improvement. One area he wants the government to really focus on is power supply. “In the case of power, it is okay, but there is more to be done; everything should be done to provide the megawatts which government pledged before the end of the year, about 6,000, or about 4,000 recommended by the National Confab Committee on Power,’’ Nwobodo said.